Confessions of a dance pants addict: SFOF Class Card Sale -- Come Dance With Us! The blog of Sophia Ravenna, a tribal fusion belly dancer. SFOF Class Card Sale -- Come Dance With Us! 1. Starting in October, Fire & Gold student troupe rehearsals will be open to everyone as we learn a group choreography to be performed at the holiday showcase. That's right, you'll get a performance opportunity without having to commit to being in a troupe. Our rehearsals are conveniently held right after the Wednesday night Choreography & Combinations class. 2. 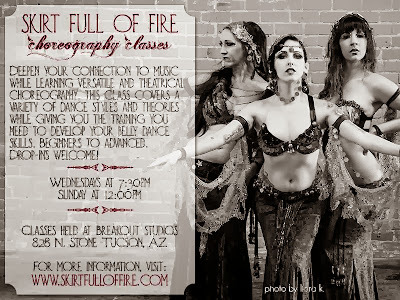 Until the 30th, Skirt Full of Fire is having a class card sale! You can save on 5 and 10 class cards, or really treat yourself and get a 30 day unlimited pass. Or if you're not sure whether you're ready to take the plunge, you can get two-for-one drop-ins. Check out the newsletter for complete details and links to purchase your cards. 3. If you've followed my progress over the past few years, you may have noticed a steady increase in my skills, emotionality, confidence, good attitude, makeup and costuming. Now granted, some of that is due to my own hard work and dedication, but that wouldn't have been nearly as effective without a great teacher directing my work in the right direction. Jolie helps her students grow as dancers with great instruction, firm but gentle correction, and lots of encouragement. I can't recommend her highly enough and I'd really love to see more people in class growing alongside the current core group of students. Join us! Thank you for reading, please feel free to ask questions, post encouragement, make jokes, and otherwise be a part of my blog! I split my time between tribal belly dance and creating beaded jewelry. I like the color green, shiny things, corgis, my husband, tea, and hanging out with dance friends. One of my favorite eyeshadows! At long last, my tattoo is complete!